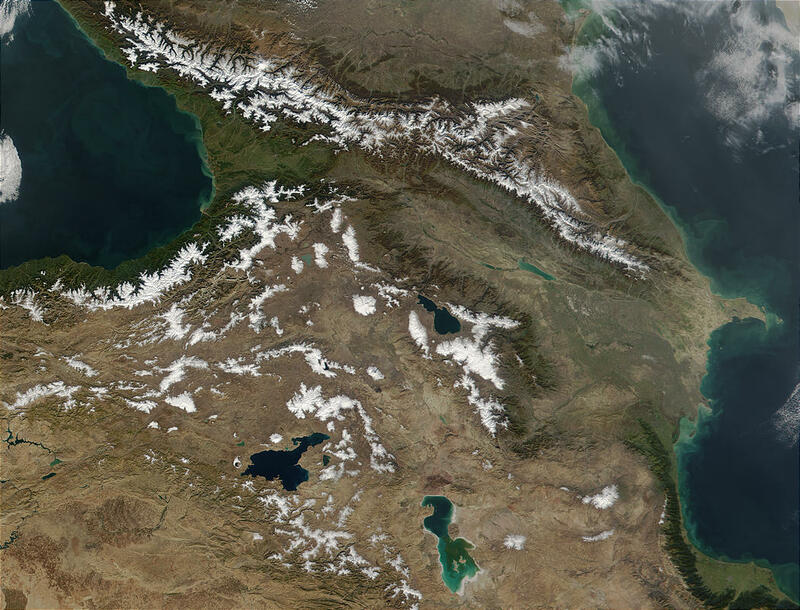 Often regarded as the southeastern border of Europe, the Caucasus Mountains can be seen here stretching from the Black Sea (left) to the Caspian Sea (right). The mountain range spans 700 miles (1125 km), crossing the countries of Russian Federation, Georgia, and Azerbaijan from left to right respectively. With a snowline of approximately 11,000 feet and peaks such as Mt. Elbrus, that reach 15,000 feet, much of the snow visible in this image is present year round. Also visible in this image are apparent phytoplankton blooms in the Caspian Sea, marked by blue-green swirls.